"Fire In The Hole" refers to the term used by coal miners blasting-away rock to make a living. The cry was a way to warn other miners that a dynamite triggered explosion was about to take place. Coal miners in Atlantic Canada came to represent the struggle and toil of seasonal and manual labourers in that part of the world. Their dark and dangerous work will always be associated with the Springhill Mining disaster. During the creation of the Canadian Pacific Railroad, workers blasting their way through the Precambrian shield of Northern Ontario and the Rocky Mountains of the West were also known to have used the term regularly, at times before literally throwing a flint or stick of dynamite into a crevass of rock. In the United States, coal miners led the labour movement for workers rights. In 1933, the efforts of a group of organized and committed miners led to the National Industrial Recovery Act which granted workers the right to form unions and bargain collectively. A folk song inspired by the movement, called "Fire In The Hole" was written by Hazel Dickens in the 1950's. Dickens grew up in the coal mining villages of West Virginia during the Depression, and some of her lyrics are directly referenced in the Hip's "Fire In The Hole." 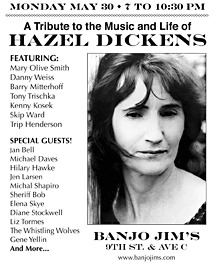 A re-recording of Hazel's song was released in 1987 for the film soundtrack to "Matewan" on the Hip's current US record label: Rounder Records. There ain't gonna be no fire in the hole"
When performed live, The Tragically Hip version of the song was usually preceded by Downie's "This is the song I hate, or is it a song a hate..." rant. At the time of the songs release, it was believed to be a reference to the then resurgent neo-Nazi movement in Southern Ontario. The CBC's "Fifth Estate" ran an expose on the inner workings of the white supremacist movement during the early part of 1994. The program included a look at the Heritage Front, a then growing hate group, and their use of heavy metal bands to spread their word. The songs angry tone, the possible reference to Nazi propaganda film "Triumph of the Will," and its direct and attacking lyrics, may be a reference to the bands personal disgust with these people and their intolerant message. The "Fifth Estate" broadcast centered on a CSIS (Canadian Secret Intelligence Service) operation which eventually rotted the Heritage Front from the inside. In 2005, the groups leader was shot and killed in Toronto. "It's the song I hate/this is the song I hate" are the last lines of Sonic Youth's Song Yough Against Fascism from 1992's Dirty."